Assigns the interface to the standby group ID and the virtual IP address specified. The MAC address will be calculated automaticaly. Sets the priority for the interface in the specified standby group. Enables preemption for the specified standby group ID. In this topology, the virtual IP address will be 192.168.0.1 and the two gateways will be 192.168.0.2 and 192.168.0.3. They will both share the virtual IP address and a virtual MAC address will be generated for the standby group. Host will have 192.168.0.1 set up as its default gateway. Router R1 will answer for the virtual IP address 192.168.0.1 and virtual MAC address 00:00:0C:07:AC:01. Whenever a host sends a packet to its default gateway, R1 will be the one to answer. If R1 fails, R2 will take over as the active router and it will be the one to answer all requests. The first step is creating the standby group and assigning the virtual IP address. Usually we would like one of the routers to be preferred over the others. To accomplish this we will set the priority. For HSRP, higher is better. The default priority is 100, so it is not necessary to modify it on R2. R1 is the current active gateway. 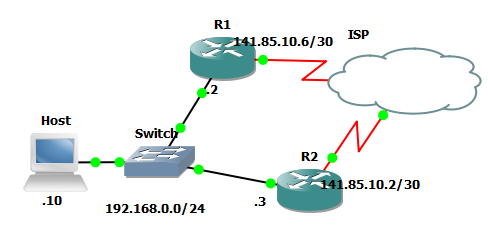 Connecting to the virtual IP through telnet should create a session with R1. To verify the configuration, we will shut down f0/0 on R1. Router R2 will take over as the active gateway and a ping from Host to the virtual IP will still work. Next, I will reset the f0/0 interface on R2 so that R1 will take over for it and then issue another ping. The ping should go through router R1 this time. The above would have happened automatically without the need to reset the f0/0 interface on R2 if preemption were enabled. R1 would have taken over immediately because of the higher priority.